We will send USA traffic to your website daily! See review from satisfied buyers. ALL kinds of website is allowed. Up to 1000 daily visits from USA for 60 days. We will promote your website and drive real traffic to it!! Feel free to ask before ordering!! IF WE CANNOT PROMOTE YOUR SITE FOR ANY REASON WE WILL REFUND YOUR MONEY ! PRICE WILL GO UP IN A FEW DAYS! 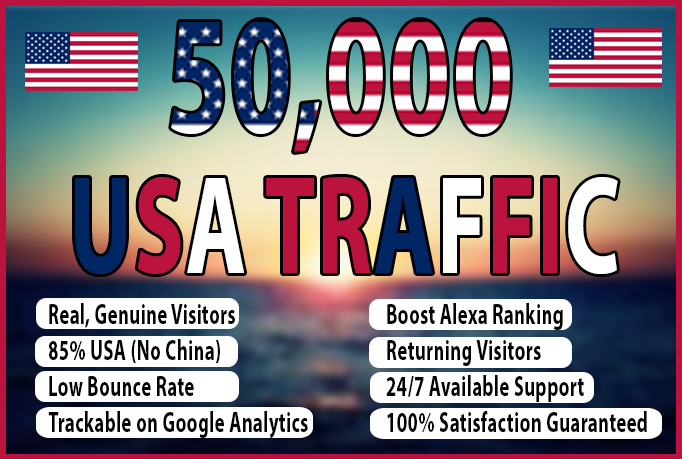 For Only 20 dollars you will get 50,000 USA Keyword Targeted Traffic is ranked 4 out of 5. Based on 8 user reviews.